It’s a simple recipe, but quite time consuming to make, due to the time required to wait for the dough to rise (a couple of times). You’ll need to preheat the oven to 350°, but don’t do this up front, as you’re a few hours away from needing it. Ideally, you should have a tube pan, as that’s the best way to bake the bread. And here’s how to (hopefully) turn those ingredients into Monkey Bread. Combine 1 cup flour, plus the listed sugar, yeast and salt in large bowl of electric mixer. Stir well. Heat milk and 1/4 cup butter until very warm—120°F to 130°F. Gradually add the heated butter/milk mix to the dry ingredients, and beat at slow speed, scraping sides of bowl occasionally. Beat for 2 minutes. Add egg and 1/2 cup flour. Beat 2 minutes more. dough that leaves the sides of the bowl. or until smooth and elastic. Place dough in a greased bowl (I used butter), spread butter or margarine on top of the dough, then cover loosely with plastic wrap or lid and let rise 90 minutes to two hours—until the dough ball has doubled in size. Punch down the dough and let it rest 10 minutes. This is a good time to turn on your oven, depending on how quickly it preheats. Divide the dough into two equal parts. Roll each half out to roughly a 12″ x 9″ rectangle. Cut diagonally in both directions, spacing the cuts roughly two inches apart. When done, you’ll have a lot of tiny little diamond-shaped pieces. Melt additional butter, then dip each piece in butter, coating thoroughly. 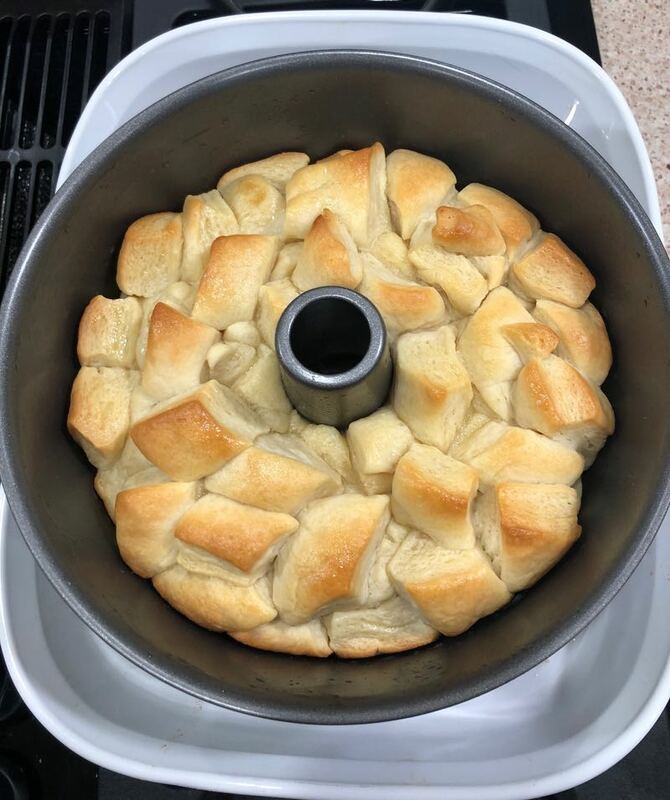 Arrange in overlapping layers in ungreased 10″ tube pan. Cover loosely and let rise about one hour or until double in size. Bake in preheated oven for 40 minutes. Check at five minute intervals after about 20 minutes, and cover the top with foil if necessary to prevent over browning. Remove from oven, and baste top with melted butter. Best served warm. This bread freezes well and can be reheated for serving. As I hate messy ovens, I put the tube pan in a large casserole pan, and cooked it that way—this captured any leaking butter before it could escape to the oven’s interior. The recipe is very sensitive to using the right amount of flour–add the final 2.5 cups slowly, stopping when the dough is pliable and not sticky to the touch. For serving, we put the bread in a glass pie pan, which worked well.